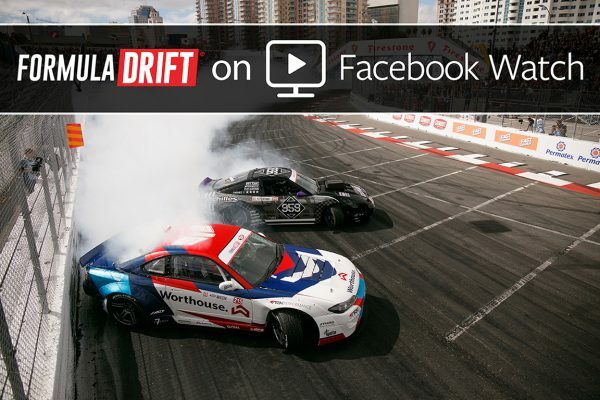 Formula DRIFT –  the world’s premier drifting series – is excited to deliver live and on-demand content produced by FD Studios on Facebook Watch. Live and on-demand shows will kick-off from April 1, 2019, in conjunction with the first competition round of Formula DRIFT: The Streets of Long Beach. The newly-formed FD Studios will create more than 100 hours of original content featuring specific shows with air dates on Facebook Watch, focusing on the action and drivers of the Formula DRIFT Championship. In addition, Formula DRIFT will continue to deliver the most widely viewed drifting livestream in the world to fans on Facebook by utilizing Facebook Live. “We are very pleased to see that our content, both live and on-demand, has performed so well on Facebook. In that spirit, we are excited to continue to develop our brand on Facebook Watch and reach and develop new fans for this amazing sport,” said Ryan Sage, vice-president of Formula DRIFT. With this new partnership, Formula DRIFT is continuing to ensure its large, young audience is able to watch and enjoy its content on their favorite platforms. This includes the hugely popular Formula DRIFT livestream from every round, which is available on Facebook Watch and formulad.com. The Formula DRIFT Championship is also shown on CBS Sports Network. And for 2019, FD Studios will create exclusive content, which will be available on Facebook Watch. With the start of the 2019 season just a few weeks away, there has never been a better time for FD fans to follow their favorite sport. The 2019 Formula DRIFT series kicks off on April 5-6 with the O’Reilly Auto Parts Streets of Long Beach presented by Permatex. Visit formulad.com for event details, ticket purchases, driver profiles and livestream information.